I have no idea who Bob Andy is or why this pie is named after him. From what I understand, this is a popular pie from Indiana Amish country. 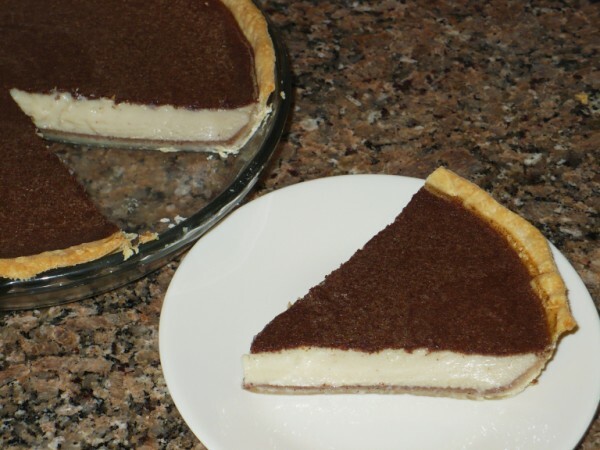 The brown "crust" on top is formed when the cinnamon rises to the top of the custard during baking. The recipe calls for whole milk, which I didn't have, so I made it with 1% and it turned out just fine. I think it just lost some creaminess and fullness in the custard, but it's still delicious. I prefer it chilled but it can be served room temp. Adjust oven rack to lowest position and preheat oven to 325 degrees. Crack eggs in a medium bowl; brush pie shell with a little of the egg whites. Whisk eggs until thoroughly mixed; whisk in milk. In a separate bowl, combine sugar, flour, cinnamon, and salt then whisk into milk mixture. Set pie shell on oven rack and pour filling into shell. Bake until custard has set and crust is golden about 50-60 minutes. Cool on a wire rack and serve room temperature or chilled. Happy Easter! I meant to post these yesterday but ran out of time - busy day! 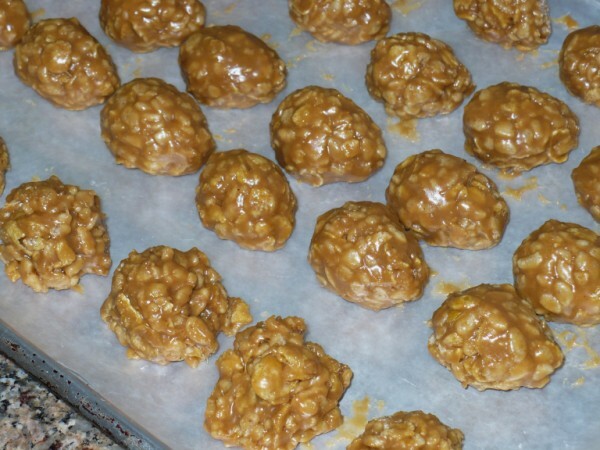 These are not the creamy peanut butter centers similar to buckeyes or Reese's Eggs. Instead they are chewy and crispy almost like a Whatchamacallit candy bar. They take some patience to make but are well worth the effort. In a large saucepan, combine brown sugar, corn syrup, and peanut butter. Cook and stir over medium heat until smooth. Remove from heat and stir in vanilla. Stir in corn flakes and rice cereal until thoroughly mixed. In a microwave safe bowl, melt chocolate chips and shortening; stir until smooth. 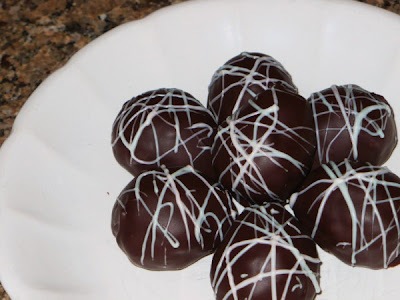 Dip eggs in chocolate; allow excess to drip off and place on wax paper lined baking sheets. Decorate with candy sprinkles or drizzle with white chocolate. Refrigerate until chocolate is firm. Eggs are best eaten at room temperature. 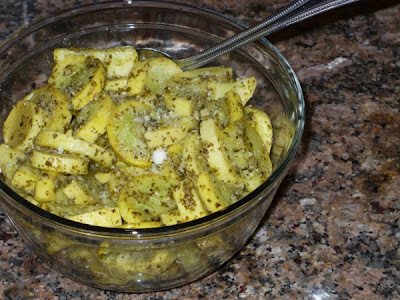 Here's another great recipe for zucchini. If you are one of those people with an overabundance of zucchini from your garden in the summer this is just another option instead of zucchini bread. If your zucchini have grown to one of those monsters about 3-4 inches in diameter, you don't need to slice on the diagonal to keep it from falling through the grill grate. Combine dressing, garlic powder, oregano, and basil in a large Ziploc bag. Add zucchini, seal bag, and shake to coat. Marinate for 30 minutes or more. Preheat grill to med-high heat. 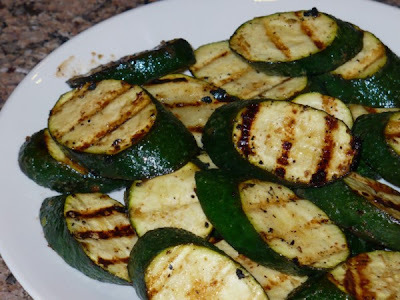 Grill zucchini slices 3-4 minutes then turn and grill another 3-4 minutes or until desired tenderness. Sprinkle with salt and pepper if desired. I have tried many variations of this recipe but always come back to the one I was raised on. It seems to have the right proportion of sauce to chicken and broccoli. In our family we would serve it over white rice, but it can stand on its own. Do not use frozen broccoli florets because they retain too much water and will turn this into soup (I know, because I've tried). When it comes to bread crumbs, I like to use panko because of their superb crunch, but regular or Italian style work just as well. Preheat oven to 350 degrees. In a medium skillet, heat 1/2 inch of water until boiling. 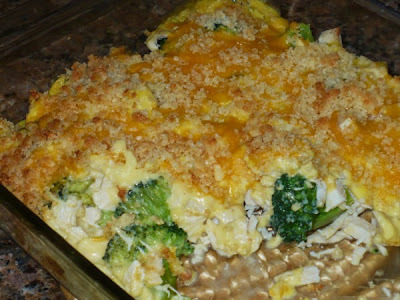 Add broccoli florets, cover, and cook for 2 minutes. Drain water and spread florets evenly in bottom of 9x13 baking dish. Sprinkle with chicken. In a medium bowl, whisk together soup, water, mayo, lemon juice, pepper, and curry powder. Pour evenly over chicken. Sprinkle with cheddar cheese. In a small bowl, combine bread crumbs, Parmesan, and melted butter; sprinkle over cheese. Bake, covered, for 20 minutes. Uncover and bake 5-10 minutes more or until breadcrumbs are golden brown and crispy. I came across this little gem on the blog I'm Topsy Turvy. 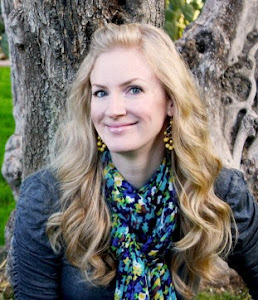 Ashlee makes unbelievable cakes and sometimes shares her favorite recipes. I love anything lemon and this just sounded so good. The flavor is smooth and light...and delicious! Combine sugar, cornstarch, lemon zest, lemon juice, egg yolks, and milk in a saucepan, and cook over medium heat until thick. Remove from heat and stir in butter. Cool to room temp and then whisk in sour cream until smooth. 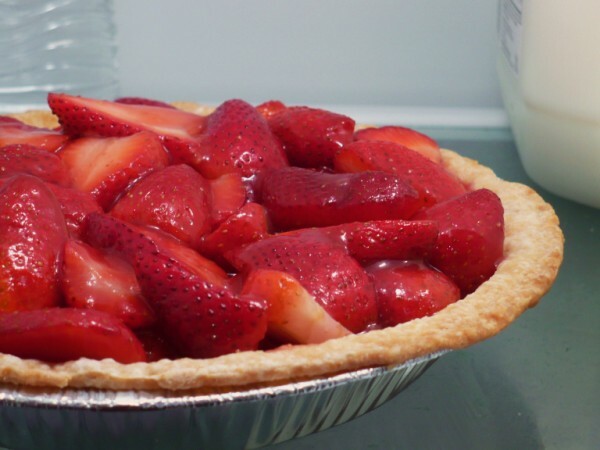 Pour into pie shell, cover with plastic wrap, and refrigerate at least 6 hours or overnight. In a medium sized bowl, combine whipping cream and honey or sugar. Beat with electric mixer until stiff peaks form. 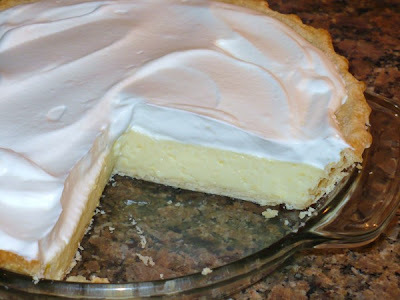 Spread whipped cream over pie before serving. This dish is great for cold weather, but I just felt like making it - especially since it hadn't made it to the blog yet. It's one of those rare recipes where I didn't change anything because it was perfect as is. O'Brien hash browns are diced potatoes with onions and peppers mixed in. You can always use regular diced hash browns if you prefer. Just make sure they are thawed out before you use them (don't ask me how I know this). Preheat oven to 350 degrees. In a skillet over medium-high heat, brown pork chops in oil. Meanwhile, in a large bowl, combine soup, milk, sour cream, pepper, 1/2 cup cheese, and 1/2 cup french fried onions. Fold in hash browns. Spread potato mixture into a lightly greased 9x13 baking dish. Place chops on top and sprinkle with seasoned salt. 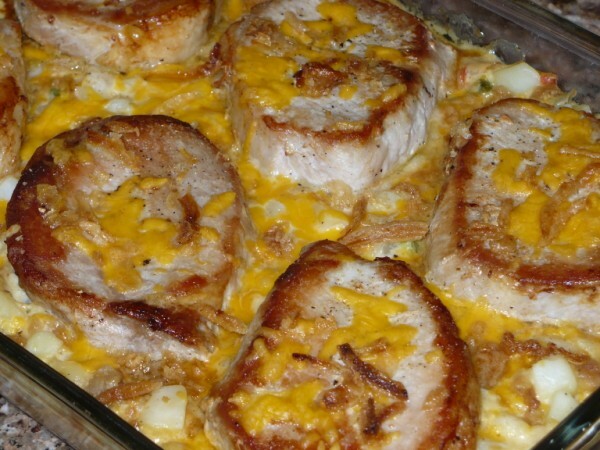 Cover and bake for 40-45 minutes or until chops are tender. Uncover; sprinkle with remaining cheese and onions. Return to oven for 5-10 minutes or until cheese is melted. 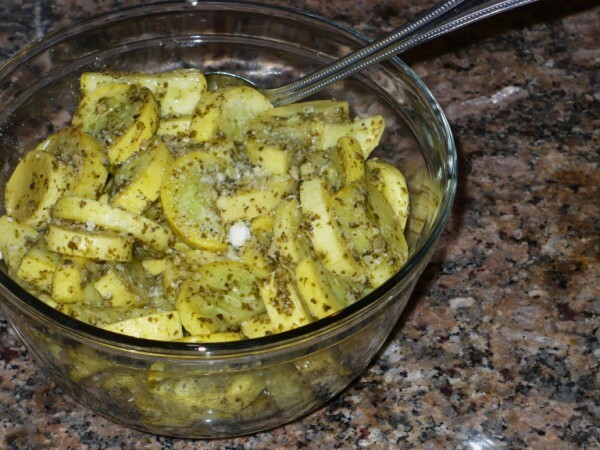 There was a sale on summer squash this week and I searched for some new recipes to try. In all honesty squash (and zucchini) are not my favorite but I like to have a variety of vegetables in my diet. I found several recipes that sounded interesting and this the first. 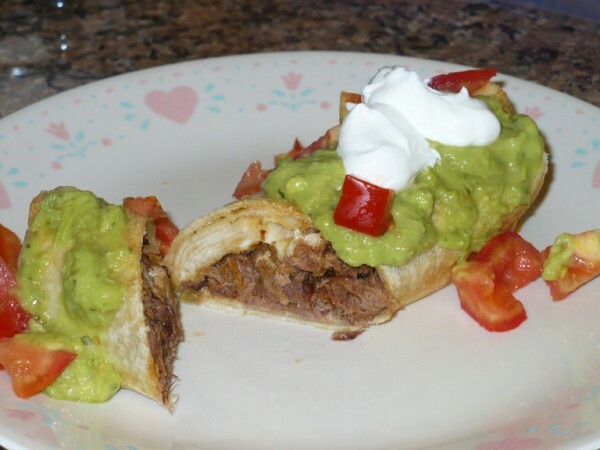 It is adapted from a recipe on Kalyn's Kitchen (which you should check out - lots of deliciousness there). Rinse squash and pat dry. Cut off ends and slice into 1/2-inch slices. Heat oil in a large sauté pan over medium heat. Add garlic and cook for 1 minute. Add sliced squash and stir to evenly coat with oil. Sprinkle with salt and pepper. Cook until crisp-tender (or to personal preference), stirring frequently. Add pesto and stir to coat. Sprinkle with Parmesan cheese. 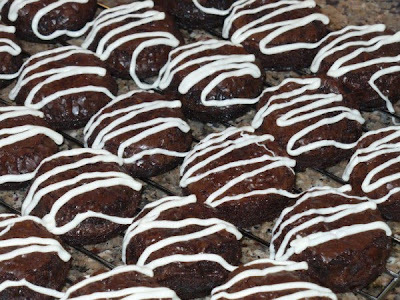 The secret ingredient in these cookies helps them stay soft. And I have to say, it seems to make them bake up attractively. Can you guess what it is? I've heard of this 'secret ingredient' off and on and have seen a couple of recipes here and there. I finally made them and now understand what all the fuss is about. It does not affect the taste and make the cookies super sweet as you might expect. Ovens vary and I found that in my oven the cookies baked faster than the time suggested in the recipe I used. So I'm leaving a big window (8-12 minutes) for you. Check your first batch at 8 minutes and plan your baking time from there. As a side note, after I made these the first time I took some with me to my jury deliberation. Everyone loved them. So now, in my mind, these will always be "Jury Duty Cookies." Preheat oven to 350 degrees. In a large bowl, cream together butter and sugars. Beat in the instant pudding mix (dry) until blended. Stir in the eggs and vanilla. Blend in flour, baking soda, and salt. Add chocolate chips and nuts (if using). 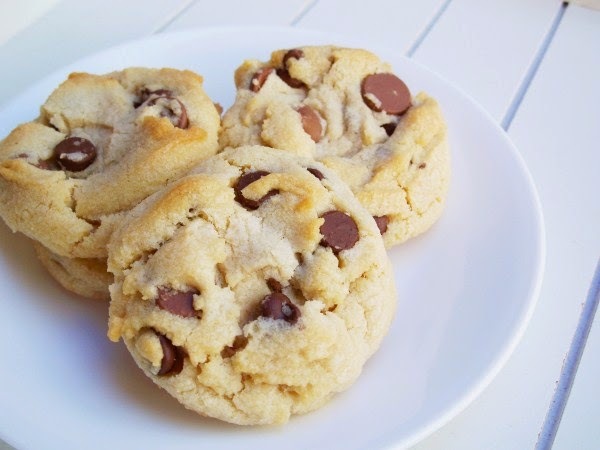 Drop by rounded spoonfuls (I use a medium-sized cookie scoop) onto ungreased cookie sheets and bake for 8-12 minutes or until edges are golden brown. Cool on pan for 5 minutes before removing to wire rack. I got this recipe from my friend, Kay. It's so simple and it tastes good, too. I can't believe I forgot to post it until now. You can thank my sister, Heather, for reminding me of this little gem. 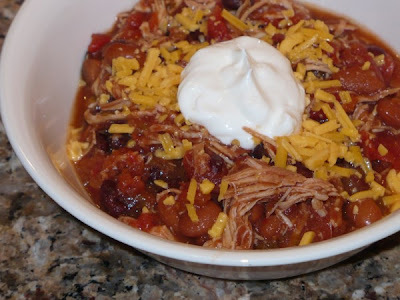 Just combine boneless/skinless chicken breasts, a couple of cans of your favorite beans (I use black and pinto), and some salsa in your slow cooker and walk away. The most work you will do is shred the chicken once it's cooked. Maybe make some cornbread muffins or or offer tortilla chips on the side. You can even use frozen chicken - just give it enough time to cook through (maybe low for 6-7 hours). Combine chicken, beans, and salsa in a slow cooker and cook on high for 3 hours or low for 5 hours. Remove chicken, shred, then return to crock. Serve with cheese and sour cream. Love this pie! When I made it, the glaze was not quite thick enough (making the pie slightly runny) so I've adjusted the recipe. You might think it's too thick when you make it, but it needs to be because the berries start to seep their own juices and thin it out a bit. I don't use all of the glaze created just as a personal preference - I like the pie to be more about the berries. I just add enough to thoroughly coat the strawberries before adding them to the crust. If you use all of the glaze, eat the pie the same day or you may end up with a soggy crust (or just add more berries and make a fuller pie). And speaking of crust! If you don't make your own, I recommend you use either Mrs. Smith's or Marie Callendar's brand frozen pie crusts. Store brands (especially Wal-mart - don't get me started) just don't cut it. This was the last time I will use a store brand pie crust. Combine 1 cup sliced strawberries, sugar, water, cornstarch, and lemon juice in a blender and puree. Pour into a small saucepan and add margarine. 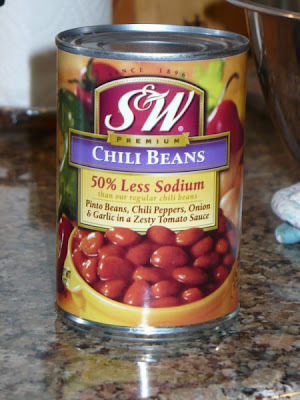 Cook over low heat until mixture thickens and begins to boil. Remove from heat and allow to cool slightly. Pour glaze (as much as desired) over remaining berries in a medium bowl and fold gently until evenly coated. Pour into pie crust and refrigerate for at least 4 hours. (Any remaining glaze can be saved for a warm ice cream topping or for a second pie.) Serve with a dollop of fresh whipped cream. 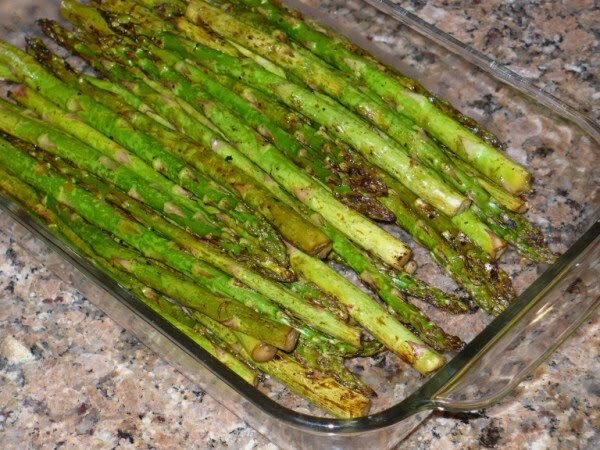 This is a great alternative to steaming your asparagus. If you don't have a grill, you can roast them in the oven at 400 degrees for 10-15 minutes, turning once. You could also just drizzle them with olive oil, salt and pepper and skip the marinade. Snap off ends of asparagus. Combine all ingredients except cooking spray in a gallon-size Ziploc bag. Marinate for 30 minutes. Lightly coat grill grate with cooking spray. Preheat grill on high heat. Grill asparagus 2-3 minutes or until desired tenderness; discard marinade. I finally found a lime chicken recipe that I like! I saw one on the Kraft recipe blog and adapted it to what I was looking for. It turned out great. We have been lucky to have warm days already and so I was ready for something springy and light and this fits the bill. Trim chicken breasts and pat dry with paper towels. In a small bowl, whisk the juice and zest of both limes, honey, mustard, soy sauce, garlic and pepper. 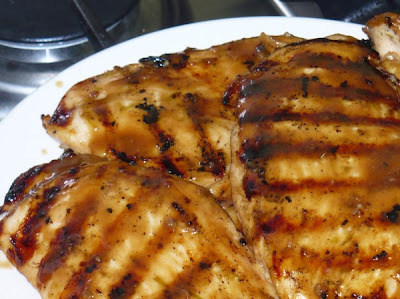 Place chicken breasts in a gallon size Ziploc and pour marinade over. Seal and marinate in refrigerator for 1-4 hours. Preheat grill for med-high heat. * Grill breasts about 4-5 minutes on each side or until cooked through. For more intense flavor, while chicken is grilling, pour remaining marinade in a small saucepan and bring to a boil. Reduce heat and simmer until slightly thickened. 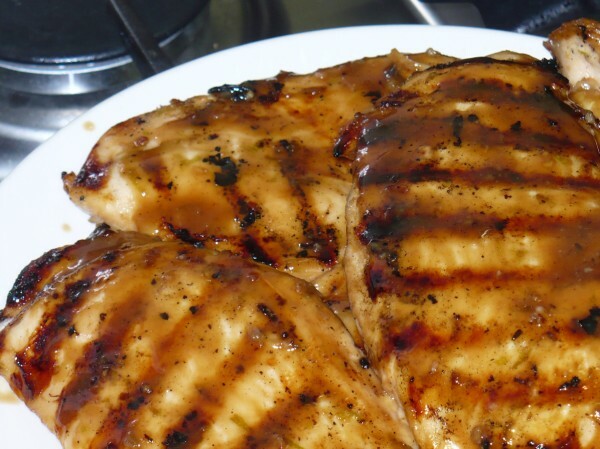 Brush over grilled chicken breasts before serving. I saw this recipe on the food blog Picky Palate. Jenny seems to love making desserts as much as I do, but she develops most of the recipes herself. My hero! These are something fun and different and they really aren't that hard. You'll get 'em done faster if you have more than one muffin tin. And I had an easier time of removing the brownies from my newer tin ($4.06 ChefMate at Target - go get one) than from my older one even though it's non-stick as well. Preheat oven to 350 degrees. Make brownie batter according to package directions. 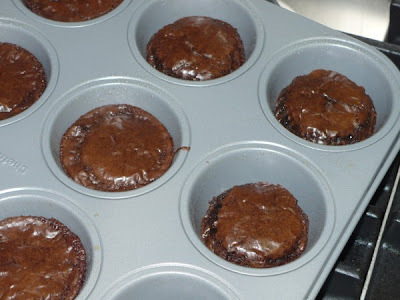 Spray muffin tin(s) liberally with cooking spray. 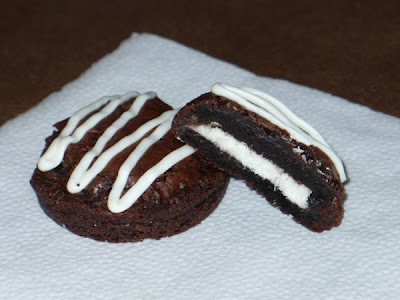 Dip Oreos in batter until completely coated and place in muffin tin. 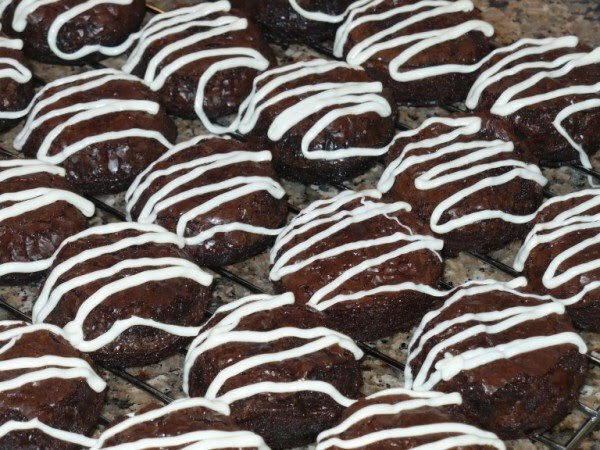 Bake for 12-15 minutes or until brownies are cooked through (they taste better if they are undercooked rather than overcooked!). As soon as you remove the tin from the oven, run a plastic knife around the edge of each brownie. Running the knife around the edges will give them that rounded look and make them easier to remove. Let cool for 5 minutes before removing brownies to wire rack. In a microwave-safe bowl, heat white chocolate chips on HIGH for 30 seconds and stir. Microwave 1 more minute, stirring after every 20 seconds or until smooth. Pour chocolate into a freezer-weight Ziploc bag and snip one corner. Drizzle chocolate over brownies and allow to cool. These got two thumbs up last night, especially from the hubby who suggested I file away this marinade for future use. I think part of what made these so delicious was the fact that I marinated these chops for 24 hours. You don't have to do the same, but if you do your chops will turn out more tender, juicy, and flavorful. Combine all ingredients in a gallon-size Ziploc bag and marinate in the fridge 4 hours or overnight. Lightly oil grill grate and preheat to med-high. 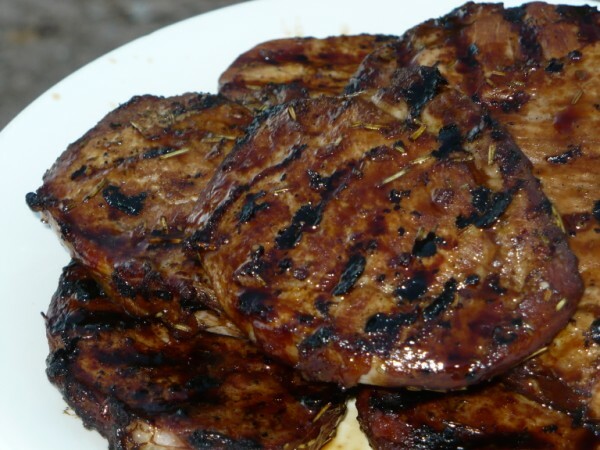 Grill pork chops until no longer pink, turning once during cooking. If desired, pour marinade in small saucepan and bring to a boil. Boil for 3-4 minutes then pour marinade through fine-mesh sieve and serve with chops.